Amazon Go is a "store of the future." You can read about it in a New York Times story by Nick Wingfield, a technology correspondent for The Times. In short, Amazon's idea is to eliminate all human-to-human interaction as shoppers do their business. 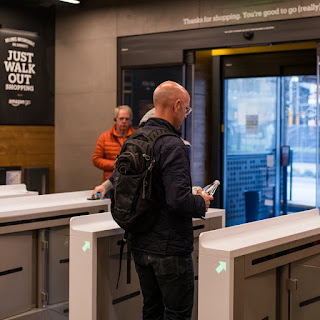 Visiting an Amazon Go store will be like shopping online, but without the need to wait even twenty-four hours for delivery. I have commented on this idea of before, in a slightly different context. I don't like the trend. Amazon will offer consumers (and that's how Amazon sees us) the ability to "Just Walk Out." My advice is "Don't Walk In!"